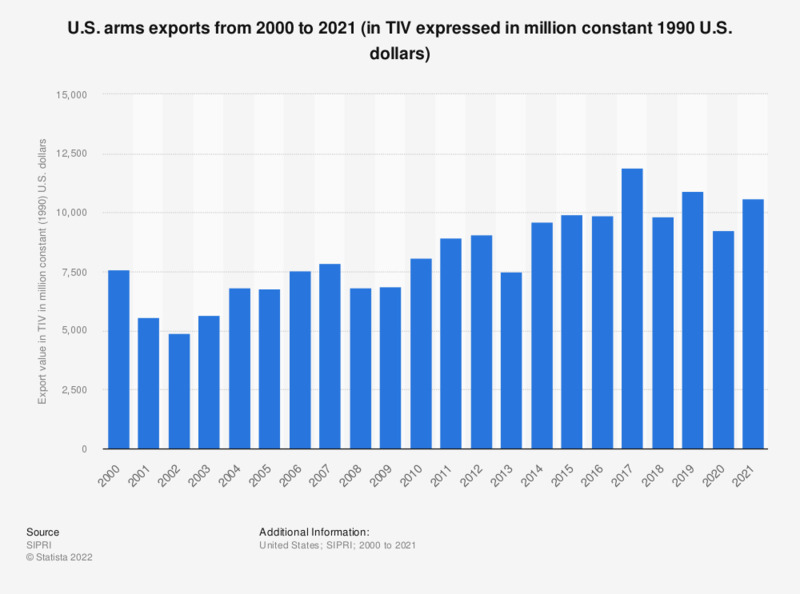 The statistic shows total U.S. arms exports in the years 2000 to 2017 expressed in TIV. The TIV is based on the known unit production costs of a core set of weapons and is intended to represent the transfer of military resources rather than the financial value of the transfer. The TIV is expressed here in million constant U.S. dollars as of 1990. In 2017, the U.S. arms exports totaled to about 12,394 million constant (1990) U.S. dollars. The depicted export value is only an indicator and does not correspond to the actual financial value of the transfers. TIV (trend-indicator value) is a unit invented by SIPRI. It is used to allow comparison between the data on deliveries of major conventional weapons and to identify general trends. The TIV is based on the known unit production costs of a core set of weapons and is intended to represent the transfer of military resources rather than the financial value of the transfer. For further information please refer to the SIPRI explanation of TIV. Everything On "Defense spending and arms trade" in One Document: Edited and Divided into Handy Chapters. Including Detailed References. Statistics on "Defense spending and arms trade"